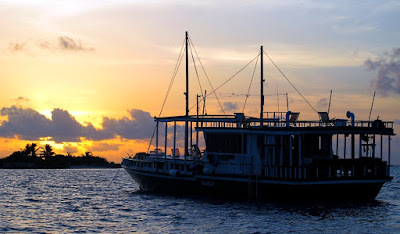 from ExpeditionCruising.com editor, Roderick Eime, travelling with World Expeditions in the Maldives. Regular readers to this blog will be used to reading about all manner of ships from the trusted and sturdy former Soviet oceanographic vessels through to the new wave of luxurious 'champagne' adventurers venturing to out to the remote corners of the world's oceans. Here in the Maldives, expedition cruising takes on a much more rudimentary guise in the form of a traditional local 'dhoni'. These traditional wooden vessels have worked the Maldivian atolls for centuries, transporting goods and ferrying locals across the vast expanses of water that separate the inhabited islands making up this expansive oceanic republic. Global operators like World Expeditions work with local boat owners to provide this fundamental, yet enriching experience here in the middle of the Indian Ocean. Our all-wooden vessel, the 20m 'Gahaa' (meaning: North Star) cruises at a leisurely eight knots between the atolls that comprise this aquatic country to the SW of Sri Lanka. Accommodation is in four twin cabins with a crew of five who look after our every need. Our 'cruise director' is young 'Teddy' who guides us on snorkelling trips out on the myriad coral reefs and enlightens us on the ways of the Maldivians who have lived, fished and traded on these flat, tropical islands for centuries. We spend our days in a blissful state of relaxing on the sun decks, swimming and snorkelling with interruptions in the form of meals prepared by our resource cook. Fish, salads and vegetables cooked to local recipes. Maldivians, however, are at something of a crossroads. With the highest point of land anywhere in the country just three metres above sea level, the rising oceans threaten the very existence of these hardy people whose ethnicity and language is a unique mix of Tamil, Hindu and Arabic. Even their native tongue shows influences from all races and their written script is an endemic blend of the complicated-looking squiggles of each culture and language group. The famous coral reefs of the Maldives are under the same pressures as similar reefs all around the world as ocean acidification, water warming and the many human influences take their toll on the beautiful marine formations created over millennia of slow accretion. My own observations make me wonder about the ecological balance of these reefs as sharks and larger predator species seem to be totally absent from the reefs we visit. Instead we see all manner of common 'aquarium' species, hawksbill turtles, rays and dolphins. Pleasing enough, sure, but is this sufficient to ensure the long term health of these delicate eco-systems?